In general, interest rates on subprime mortgages are higher than on prime mortgages to compensate the lender for the (additional) default risk associated with subprime loans. In this section we analyze the time series of the subprime-prime rate spread, both with and without adjustment for changes in loan and borrower characteristics. 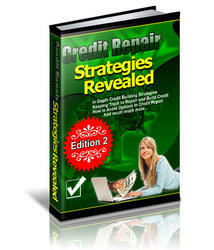 We focus on fixed-rate mortgages for this exercise. For hybrid mortgages the subprime-prime comparison is more complicated because (i) both the initial (teaser) rate and the margin should be factored in, and (ii) we don't have good data on the prime initial rates and margins. In Figure 7 we show the actual subprime-prime rate spread. The subprime rate is from the LoanPer-formance database, the prime rate is the contract rate on fixed-rate mortgages reported by the Federal Housing Finance Board (FHFB) in its Monthly Interest Rate Survey.18 The subprime-prime spread decreased substantially over time, with the largest decline between 2001 and 2004, which coincides with the most rapid growth in the number of loans originated (see Table 1). In Figure 7 we also plot the yield spread between 10-year BBB and AAA corporate bonds, which we obtained from Standard and Poor's Global Fixed Income Research. Compared to the corporate BBB-AAA yield spread, the actual subprime-prime rate spread declined much more and more steadily, hence the decline cannot just be attributed to a change in the overall level of risk aversion. 17The effects of other loan characteristics on mortgage rates have been much more stable over time, as unreported results suggest. 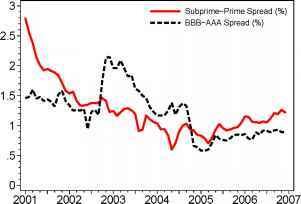 The figure shows the FRM subprime-prime rate spread and the yield spread between 10-year BBB and AAA corporate bonds. Notice that the 31prime term corrects for the fact that the spread is affected by the prime rate itself, and thus changes over the business cycle, because a higher prime rate increases the default probability on subprime loans for a given spread. 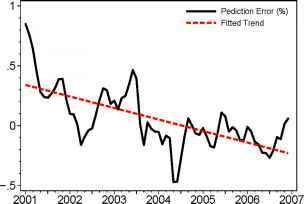 In Figure 8 we plot the prediction error, averaged per origination month, along with a fitted linear trend. The downward trend in Figure 8 indicates that the subprime-prime spread, after adjusting for differences in observed loan and borrower characteristics, declined. In Figure 2 we showed that loan quality, obtained by adjusting loan performance for differences in loan and borrower characteristics and subsequent house price appreciation, deteriorated over the period, and thus the (adjusted) riskiness of loans rose. Therefore, on a per-unit-of-risk basis, the subprime-prime mortgage spread decreased even more than the level of the spread. 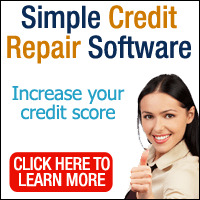 19The explanatory factors in the regression are the FICO credit score, a dummy variable that equals one if full documentation was provided, a dummy variable that equals one if prepayment penalty is present, origination amount, value of debt-to-income ratio, a dummy variable that equals one if debt-to-income was not provided, a dummy variable that equals one if loan is a refinancing, a dummy variable that equals one if a borrower is an investor, loan-to-value ratio based on a first-lien, and loan-to-value ratios based on a second, third, etc. liens if applicable. The figure shows the prediction error in the subprime-prime rate spread, determined in a regression of the spread on the prime rate and the following loan and borrower characteristics: FICO credit score, a dummy variable that equals one if full documentation was provided, a dummy variable that equals one if a prepayment penalty is present, origination amount, value of debt-to-income ratio, a dummy variable that equals one if debt-to-income was not provided, a dummy variable that equals one if the loan is a refinancing, a dummy variable that equals one if a borrower is an investor, loan-to-value ratio based on a first lien, and loan-to-value ratio based on a second, third, etc. liens if applicable. What is rate spread mortgage?